This is a photo of my Uncle, Sgt. Charles P. Shivas. 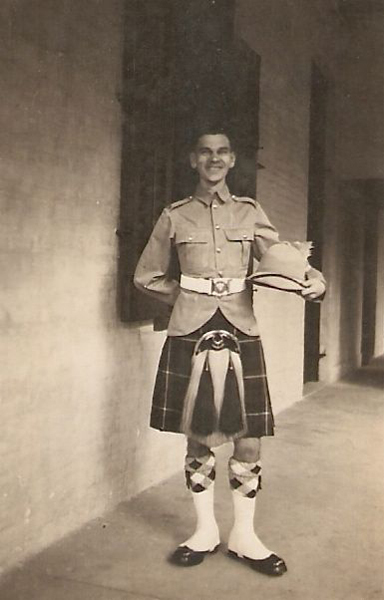 It was taken approximately 1934 when he first enlisted with the Seaforth Highlanders at Fort George. He served proudly with the R.E.M.E. (Royal Electrical and Mechanical Engineers) and also the R.A.S.C. (Royal Army Service Corps). His military records indicate he gave excellent service in many parts of the world and his military conduct was "exemplary"! I remember Charlie who was by then in his later years and I as a boy. Lasting memories is that he was always absolutely immaculate, razor sharp creases in his trousers and shoes polished to perfection. His military service left it's mark. He was always stop for a quick blether, ask what you were up to, maybe share a short story from his youth and continue his way. I remember my father, Hamish Askew, saying to me that Charlie had a great mind in terms of things electrical and mechanical.